While I could have done this post about occupational therapy, I’m going to save that for another post. 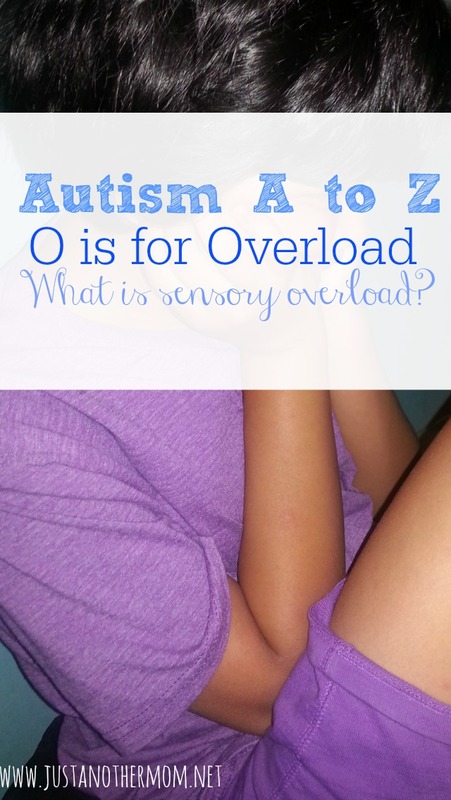 Instead, O is for Overload as we continue with our Autism A to Z series. When I say overload, I actually mean sensory overload. We’ll also talk about occupational therapy in brief but it will definitely be covered more when we get to the letter T.
So just what is sensory overload? Sensory overload happens when the brain gets overstimulated by the environment. Contributing factors could be: noises, smells, lights, too many people, texture of clothing, etc. It could really be any number of things. After awhile it just becomes too much for the brain to process. Too much sensory overload or sensory stimulation could lead to a meltdown. Is sensory overload exclusive to autism? Of course not. Sensory overload is commonly seen in individuals who have SPD (Sensory Processing Disorder) as well. For that matter, SPD could be seen as a trait of autism but should be treated as it’s own diagnosis. With Sweet B, noise is one of the biggest contributing factors to her sensory overload. She also has issues with seams on pants and socks. I’ve learned, over the years, to watch for the warning signs when something is becoming too much for her to deal with. It usually starts with plugging her ears, where noise is concerned, and will escalate from there. What helps the most for her is either having noise reducing headphones or giving her an option to leave the room. Other strategies are listed in our 5 calming strategies for meltdowns. Other things that help when she has sensory overload are fidget toys, compression vests, and weighted blankets. But what works for us might not work for you and your child. The main way to find out is to experiment and adjust your child’s sensory diet/input as necessary. Keeping a box of fidget toys handy might also help. This could include slinkys, Koosh balls, stress balls, etc.